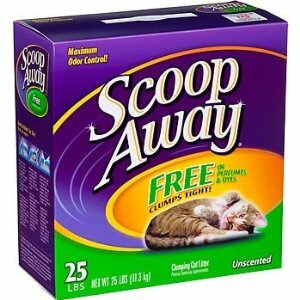 Scoop Away because of its value of price and low dust with good clumping. However something has change in its formula in the past year which has led me to this website looking for a new alternative. Though Scoop Away still clumps tight and is competitively price it has become very dusty. I've bought from different stores in central, eastern and northern Virginia, the dust is really unbearable now. My wife has to leave the room after I scoop because of the amount of dust it creates. As your website says, it changes! Join in and write your own page! It's easy to do. How? Simply click here to return to Cat Litter. I love Scoop Away. It covers odor completely and it makes scooping really easy with no alot of dust either. 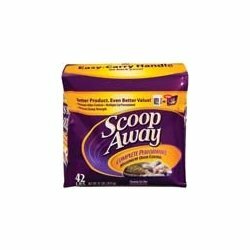 Scoop Away Complete is great for controlling odors, but is extremely...I say again...extremely dusty. I have 4 cats and 5 Litter boxes. Dust is everywhere in my house. No matter how often I dust, I can still write my name on a mirror the very next day. It's really bad when I pour it, but dust flies also when scooping. One of my male cat's urine has a heavy odor. I've tried Arm & Hammer, Tidy Cats (the worst), and Fresh Step. So far, Scoop Away works best on odor control and clumping but I really wish they could minimize the dust. As often as I change the litter, expensive litter brands are not an option, especially since I maintain the 5 boxes. My cats will not go in a covered box, so that option is out, too, and I've gone through the motors of 2 Mega Litter Maids.